We love the amount of fireworks on display around the city and the largest display this year is at Ashbridges Bay. It’s going to get started around 9.30pm but it’s bound to be packed so get there early! There are a few smaller shows too at Mel Lastman Square, Downsview Park and at Canada’s Wonderland. 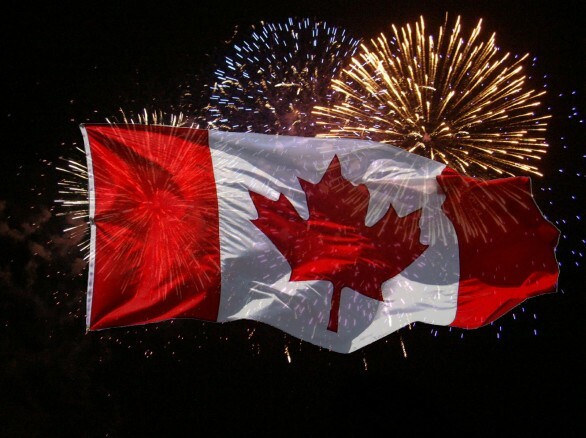 If you’re looking to celebrate Canada Day tonight, the Harbourfront Centre is having a fireworks show Tuesday night at 10:30 pm and it will be accompanied by a playlist of Canadian music. The Toronto Fringe Festival starts tomorrow with a lineup for 148 shows, including 60 comedies, 30 drama and 13 musicals. We’re thinking about taking our children to Hamlet, a kid-friendly puppet show (4.30pm at the George Ignatieff Theatre)! Also Uncle Tommy’s Campfire Ghost Stories (10pm at FIKA Cafe) sounds fun! However, there’s no rush to get the Fringe Festival tomorrow as it runs until July 12. Last Sunday Toronto Ribfest was forced to cancel its third day due to bad weather. It’s not going to take place tomorrow instead! So for meat lovers this maybe a fun event to attend tomorrow as the schedule is full of family friendly activities, live music, BBQ demos and of course tasty ribs to be devoured. The day concludes with a fireworks display around 10 p.m.
What are you guys doing tomorrow? Let us know!